use a lot of spray! Part the hair down centre from front to back……..take care and get it right! Start on one side and neaten piggy tail until it sits diagonally above the ear (roughly) get all the lumps and bumps out, the do the other side make sure it matches height and placement wise keep undoing and spraying and combing bumps out until it is neat and equal (I normally redo each pony tail twice to get it perfect). Cross and pin the plaits down across the head, wrap the ends around the elastic bands to hide them and pock ends under plait. Finally add the flowers that I will give you on exam day - please remember to return all hair flowers and numbers! Start with a tidy high pony-tail (similar alignment as the classical bun). Take sections of hair from the pony-tail and pin around, forming a messy bun. Use bobby pins and hairspray to secure. Photo to come. 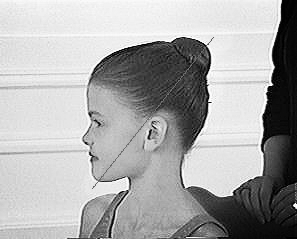 Start with a high pony-tail (similar alignment as the classical bun). Twist hair around hair tie and use bobby pins and hairspray to secure. Photo to come. Essential to smoothing any fly-aways! This is only good for getting nots out, it doesn't give a good finish. Hair nets are best as you can twist them to go over the hair twice, providing much better shape to the hair.